This week’s topic is more administrative than usual, because I want to get a better understand of how you’re commenting here on the blog. Comments are really important and I think there tends to be great discussion on this site. Though there is the occasional comment deletion necessary, I’ve had no reason to think about moderation because the conversation is nearly always civil and substantive. A couple months ago, I switched our email system to allow people to comment directly from the email notifications thinking it would help spur more comments. While the rate of comments hasn’t changed, it turns out that very few of you are using the email comment option. So, help me out. Do you not like the email comments for some reason? Is there something technically wrong or is it personal preference? Let me know so I can keep fine-tuning how comments work. I read from the web, and I comment (occasionally) from the form on the web page. I don’t have any real interest in connecting to stuff like this through email. Thanks for a consistently interesting blog! Same here. I have usually read the blog post before I start sorting through the daily deluge of email. I too read on the web and comment through the web. My email is overloaded as it is, I don’t use it for reading blogs. Same here. However I did link this sight from another blog that I read regularly, http://www.secondavenuesagas.com. Although a transit blog, I did note the similaraties between the two & highly recommended it to all readers there as we were discussing transit to LGA in recent days. Same here. read & comment here. I do like getting the email notices whenever any further comment is posted on a post i’ve commented on. plus i like the buzzing on my phone :-). Agreed Grichard. I read on my laptop at work, or maybe through a tablet. I see no reason to email a comment in. If you email a comment in, how does it display your name? I’m assuming it displays your email address. I don’t want my email address published and end up in any more spam databases than it already is. The other thing is, old habits die hard. Also, I like to read what others are saying before I respond… to avoid being redundant, etc. +1 to all above. Just makes more sense to read existing comments first. In the next version of Postmatic there will be a feature in which when you are reading the post in your inbox you can reply with the word ‘update’ to have the full conversation on that post emailed to you immediately. You can then jump in on that conversation from your inbox as well. Expect it next week. Hey Dave – If you comment from email your comment shows up exactly as it does if you comment from the web. Including you user info. I discovered your site via the SkipLagged kerfuffle. I too was worried that if I emailed in a comment it might show my email address. I’m not a big fan of comments in general. They rarely add to the discussion. I’d love to have a setting where I could (by default) hide all of them (across all news sites), in perpetuity: meaning that I would not see any comments for any news/opinion/etc article unless I took some explicit action (like clicking on a link or etc). Your text is consistently well thought out and planned. Most comments (in general, across the web) aren’t. The posts on CF are excellent, and many of the comments add to it. A comment commenting that comments rarely add to the discussion, which ironically has generated further comments. Great stuff! For me the blog gives valuable information, and the comments further information and entertainment. I would not have seen this comment to comment upon by just reading the email. Outer Space Guy.. I generally agree with you on comments, and I’ve written a grease monkey script to hide them on my local news site. Cranky’s site is one of those I almost always read the comments, and participate in. They’re generally good. I agree. People that read and comment on industry and more niche blogs actually care about the topic and have good experience, insight and opinions, and can have friendly fun discussions – even heated or disagree and still keep it respectful. I’m gonna have to go ahead and disagree with you on that, Outer Space Guy. I often find comments more interesting than the original story. Many times the readers have a different perspective, or can shed more light on a topic. The one thing I wish sites had was a way to more easily show the new comments. More like a news reader. I also read the blog from the web. While new post come online promptly before 13.00 (CET) it has been my experience since you switched email system, that the email have a worse on-time arrival than Southwest. So commenting from email has not really been a useful option. The problems that we’ve had with delivery on this site are directly related to some limits imposed by the web host. We’ve been working behind the scenes with CF on that for about a month now. It’s been such an issue that we’re re-writing our entire delivery system to be able to work around limits imposed by hosts. We hope to have that ready in the next few months. Sorry about this…. Maybe the lack comments just reflect how spot-on your commentary is? Nah. Honestly, I hadn’t noticed the new functionality. I always read the articles after I receive the email. Since the comments don’t appear in the email, I’d rather go to t he webpage, read the article there and then the comments. If I’m going to comment, I like to see what other people have already commented. Soon you’ll be able to request the full conversation right from your inbox as well. See my response to Jim M, above. First of all, thanks for what you do. I read your email version, and if it’s something of particular interest (controversial – in particular!) I like to see the reaction. If you could move the “view this post online” to the top of the page, that would be useful. Otherwise, I appreciate and enjoy your work – as well as some of the well thought out comments! Here’s a secret: you can click on the title of the post right at the top of the email to see it online. I read from the web because the email delivery time is very sporatic. It comes any time from 9:00am EST to as late as a few days later (still doing this). The email is always well after I want to read the blog. I also prefer to read other comments first before making a comment so I avoid redundant comments, or make mine as a reply to the appropriate one. hear any and all feedback. Not to sound like a broken record, but I also read your blog on the web while drinking my morning coffee, so I don’t really have a use for the e-mail commenting system. As someone else said earlier, my e-mail is already clogged up as-is, so I don’t usually subscribe to newsletters or blog notifications via e-mail. I read the articles daily, but haven’t commented much. It’s not that I don’t want to comment or have a discussion with others. Usually, someone’s already made the point I’d have made. Or, I’m just too busy to do much more than read and move on. But I do enjoy reading others’ comments, and appreciate the robust and varied viewpoints we have here. I read mine on the web as well. It’s usually the first thing I read once I sit at my desk in the morning (even before e-mail). I much more prefer coming to the web on my own than having, yet, another e-mail to read. One thing that I find interesting is that since I use Chrome to navigate to the site, my smartphone has realized I like the site and always has the site as a Google Card (via Google now) right on my home screen beside the temperature outside and the traffic reports to the office. Pretty cool feature for an aviation and tech geek like me! Are you using a MAC or PC? Would love to know how you get those notifications. Sounds interesting. iPhone or other? If you have an iPhone, you’ll need to download the Google search app and then sign in to “Google Now”. If you have an Android phone, it’s already available by touching the “home” button and swiping up. On Android phones, you can also create a widget with Google Now. That will place it right on your home screen. The “card” will start showing up after a week or so of navigating to this blog (at least it did for me). Yup, I have seen CF on Google Now for a while now as well. Alas, almost always after I have already read the post of the day, usually with my first cup o’ coffee. 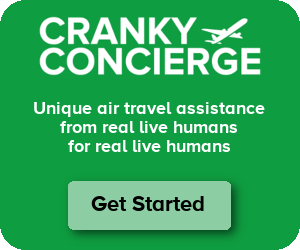 I do admit that now I’m not readiing a lot of the email comments due the new email format as the first screen of the email will have the ‘Cranky Flier’ logo/photo and I have to always move down to read the comment. I never respond to a comment via email, but will come back to the web and find that persons comment and click reply or just add a new comment of my own. We are going to be reworking the comment notification templates to be simpler and more to the point. We are going to focus on an above-the-fold presentation of the new comment (which might mean removing the header image) and then provide the context in which the comment appeared further down the email. That way you can see exactly what’s new without bothering with your mouse. Thanks Jason. I agree with David. Too much image. One of the things with the template is its not consistent where the new comment is located. It would be nice if it was always in the same spot. I read and comment from the web and only when I’m sitting at my desk. Sometimes I’ll look up the blog from my tablet while waiting in an airport (of course) but most of the time when I’m traveling I don’t have the time for fun on the interwebs. That said, I do often like reading the comments more than the article (no offense). Love the dialogue and the platform to disagree if I wish. I’ll usually read the post in my email (whenever it arrives) Then go to the website to read comments, see if there’s anything to add, then comment if I want. One issue is the fact that emails have been arriving so late, so many times I’ve already read the blog and commented before the email arrives. The other issue is that I can’t see what has already been commented in the email, so a comment from email almost seems like shouting into a vacuum. (And some using that functionality have treated as such) I don’t necessarily want emails each time someone comments (either before or after I do) clogging up my inbox, so while the email is a great delivery method for the post, the website is the best method for reading/providing comments in my opinion. One other thing to note: I wish the mobile version of the site displayed comments and replies to comments in a much more friendly manner. The way it’s currently displayed when you have replies to comments is frankly terrible. I enjoy getting the posts by email because it’s a reminder to read the content during my busy day. I see the comments section as a forum or discussion among readers and Cranky. If I have something to post, I want to see what’s already been said and either speak to it or start a new discussion. The email reply doesn’t allow me to do that. I certainly see the application for an email reply, but I don’t think it’s as practical in a blog like this where posters often rationally comment to each other instead of just spewing thoughts. speed on the comments right from your email. Thanks! I agree with your comment, Chicago Chris. Although I prefer to receive Cranky Flier posts via email, I almost always click over to the website to read the post and the comments and, if I wish, to comment myself. I appreciate that CF encourages, and often participates in, interesting, informative and sometimes very lively discussion in response to his posts and between commenters. So I hated the new comment system when it came online. I’m a “gimme the content only” guy. I was four years behind just about everyone in sending HTML email but I’ve gotten to like the new system. My one concern is properly removing quoted text in the reply. I’ve gone to just removing it from my reply. Before I did that I saw random characters showing up at the bottom of my comments. library. Let me know if it happens again! Ah okay.. I’ll try not stripping out the quoted text. Ahh. See that “>” on the last line of the above comment? That is where the stripping out failed to function completely. you could reply straight from your email, I like it. Please keep it! 1. The ability to subscribe to comments on a specific post via email without commenting. 2. The ability to post a top level comment via email without getting the blog entry emailed to me..
‘subscribe’. I don’t understand what you mean about #2. Tell me more? I subscribe to the RSS feed. Unfortunately, I get too many emails as it is. This comment system seems to work fairly well, so thanks. I use Feedly to aggregate my RSS feeds and read from the web or my phone. I can’t possibly fathom trying to do this through email and I wouldn’t want to. Four email accounts with dozens of emails daily would just send a great blog to oblivion. Thus, I read via the web and comment via the web. I love the ability to send comments to postings by email. The downside is that sometimes you submit a comment without having read other comments or the latest comments. However, that can happen on the website as well. Thank you everyone for the feedback here. I think Postmatic appreciates it as well. I’m going to work with them on the part about the name defaulting to the beginning of your email address (not your entire email address, let’s be clear. It’s only the part before the @). Indeed. Thank you all for your feedback. This was incredibly valuable to us. Your generosity is astounding. 1. You are apprehensive to leave a comment by email because you aren’t sure what has already been said. We addressed this in Beta 16, which came out last night. Now when you get a post you can also receive a copy of the comments to date by replying with the word ‘subscribe’. The subscription confirmation message contains the full conversation, which you can then reply to to jump in. 2. There was some concern about email addresses being published with your email comment. This doesn’t happen… there is nothing to worry about. If you had originally subscribed to CF using your full name and email address your comment will publish as your full name. If you subscribed using just your email address your comment will publish as the first word in your email address. For example jimmy.jones@yahoo.com will publish as Jimmy. Tinkerbell23@gmail.com will publish as Tinkerbell23. We added some language to beta 16 to make this more obvious. 3. New posts arrive in your inbox too late. This has been an ongoing issue with this particular web host. We are remaking our API to work around the limitation but it might not be resolved for a few more months. This was completely unexpected (and unheard of) when CF signed on to use our service. We hadn’t experienced this particular kind of throttling on any of the other few hundred hosts we are installed on. 4. Some folks wanted an easier way to view the post online. That’s already in place but it is a little bit hidden. When you are viewing the post in your email just click on the post title to visit the web version. 5. The comment notifications require too much scrolling to get to the good stuff. I hear you and agree whole heartedly. We’re fixing that now and will have redesigned templates ready later this week or early next. 6. You get too much email already. Thanks again. You are wonderful for sharing your thoughts and time with us. Jason – all these enhancements sound great. No one who reads CF on the web needs to use it, but it always nice to have more options. And some of us who fly a lot may read or respond while disconnected. Just wanted to circle back to let you know that we just pushed the new simplified comments template live. Thanks again for all of your help!